4-Play is designed so it can be broken into two, three, or even four separate blocks, allowing you to use one block for one spot or for multiple areas and making 4-Play blocks the most economical block available. 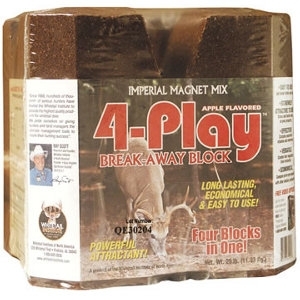 High-performance Magnet Mix attractant in versatile block form. 25 lb. block, pre-scored so it can easily be broken into up to 4 blocks (6.25 pounds each) if desired for multiple sites. Contains multiple scent and flavor enhancers, including Whitetail Institute Devour.